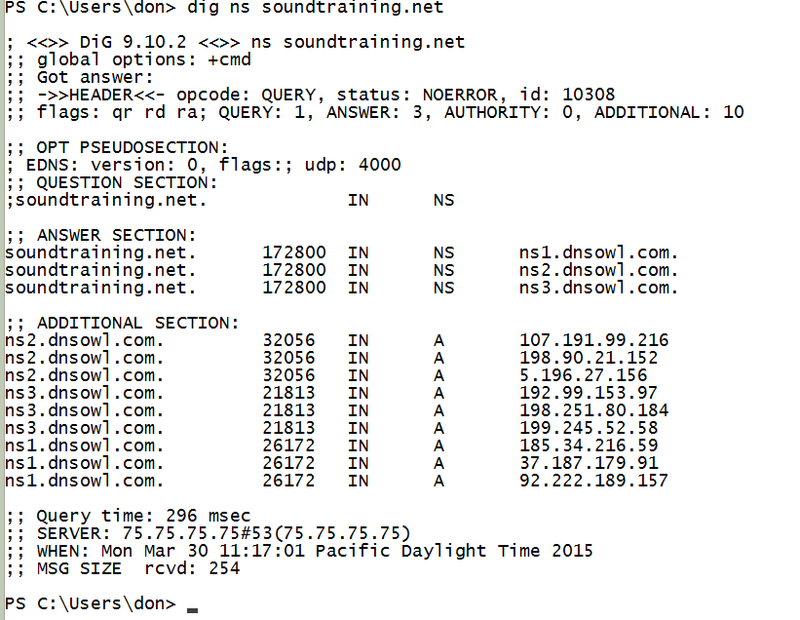 I'm getting ready to teach a class on BIND DNS for a client. I thought you might find a quick and easy guide to installing the dig and host utilities on Windows systems helpful, so here it is. The dig and host utilities are available for Windows computers. This guide assumes you’re running a 64-bit version of Windows. If you’re running a 32-bit system, the procedures are similar, but not the same. Download the BIND package from www.isc.org/downloads. As of this writing, the recommended package is 9.10.2. Download the 64-bit version for Windows. The 64-bit version also requires the Microsoft Visual C++ Redistributable package, which is available at http://www.microsoft.com/en-us/download/details.aspx?id=30679#. Download it and install it before continuing. Once you’ve installed the Visual C++ Redistributable package and copied the above files into System32, you can run dig and host from a command prompt. In the following screen capture, I ran a dig query in Windows Powershell.